From 1964, he begins producing his most well-known works, such as “Cyborg 009,” “Kamen Rider,” “Sabu to Ichi Torimono Hikae” and begins to carry his work over to animation and live-action film. 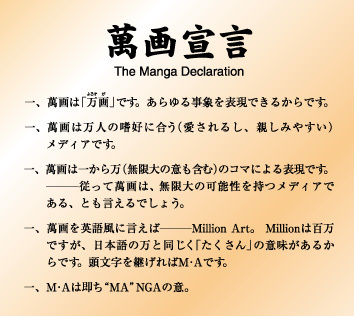 Around this time he also begins taking on many other non-manga related projects, and as part of his attempts to push the limits of the medium, made the ‘Manga Declaration’ in 1989. Passed away on January 28, 1998 at age 60. 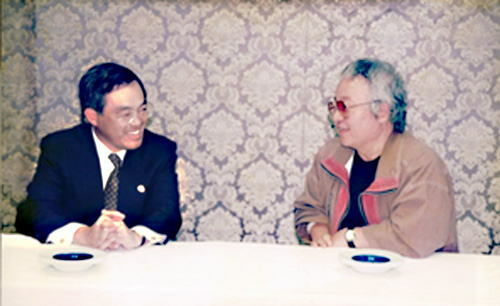 The connection between Ishinomori, born in Tome City, Miyagi Prefecture, and Ishinomaki City, came into being in July 1995, when an interview was held between him and the Ishinomaki City Mayor of the time. It is said that Ishinomori in his school days rode his bicycle for about three hours to get to the Okada Movie Theater in Nakaze and watch movies there. The exterior of the Ishinomori Manga Museum was designed to resemble a spaceship. It was built based on a design by Ishinomori. These are the words left by Ishinomori while creating architectural models for the museum. I have made a model of what I think might look good. A building with a sense of fun; not like the boring official buildings so often built by hard-headed government people. I know that ship-building played a big part in Ishinomaki’s prosperity. Wouldn’t it be fun to imagine if a space ‘ship’ had landed here from Manga planet!? Take a look at a map of Nakaze Island. It looks just like Manhattan, New York, which as you know was the center of the world economy in the 20th century. Now, we’re in the 21st century, when intangible things will become more important. We’re talking about manga, so how about if we make it Mangattan! Actually, we have already been calling it the ‘Mangattan Project’ ourselves for two years now (since 1995). I am hoping that in the future, this Mangattan area will become a kind of exciting mini amusement park. Now, enough about the concept, the most important thing is the content. Of course I want exhibit my own work, but I’m also hoping that other manga artists will come together to have exhibitions and events here. In that sense, the museum will never be “finished” and will never stop progressing. And most importantly of all, I want to make it a place to promote Japanese culture (just for the record, I’d like to make it clear that I am not limiting it to manga only) to children and all over the world; somewhere to cultivate human resources and offer opportunities for lifelong learning (Ishinomori was involved with research on lifelong learning together with the current Ministry of Education, Culture, Sports, Science and Technology). Finally, if I could wish for one more thing, it would be good if it could be given a welfare aspect, offering employment opportunities for older people. To make long story short, I hope for it to be a place where both young children and grandpas and grandmas can come and enjoy themselves. In the future, I would want to join in the fun, since I plan to live in nearby Tashiro Island. In 1998, Ishinomori passed away at the age of 60. 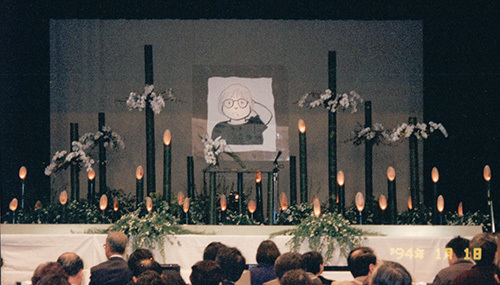 Just six months before his death, Ishinomori took part in Manga Project events and social gatherings held in Ishinomaki. After his death, the citizens of Ishinomaki City volunteered to inherit and continue Ishinomori’s project and ideas, and by gathering names through petitions and other activities, momentum was built up towards the realization of the Manga Museum. Finally, Ishinomori Manga Museum opened on July 23, 2001, about six years after the interview. Ishinomori’s plans were realized and community development in Ishinomaki started a new phase, using manga in planning and promoting the medium to a wide audience. Why 萬画(manga) and not 漫画(manga)? Ishinomori expressed the word manga using these characters 萬画 as opposed to the more usual 漫画. This is from The Manga Declaration written by Ishinomori in 1989. In The Manga Declaration, Ishinomori proposed that, 漫画manga is a form of media with limitless potential, and therefore, it is not 漫画manga but 萬画manga (using the character for countless or many) representing the plurality of ideas. 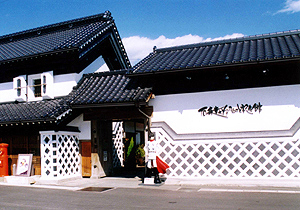 Therefore, Ishinomori Manga Museum is a Manga Museum with a purpose. Through exhibitions that show Shotaro Ishinomori’s works from many perspectives, visitors can experience the limitless possibilities of manga. In Nakada, Tome City, Miyagi Prefecture, where Manga artist Ishinomori was born, can be found the ‘Shotaro Ishinomori Furusato Kinen-kan (Memorial Museum).’ Here, visitors can experience Ishinomori’s personality through the richness of the surrounding nature, which definitely played a major role in the creation of Ishinomori the manga artist. By visiting both Ishinomori Manga Museum and Shotaro Ishinomori Memorial Museum, you will be able to gain a deep understanding of the world of Ishinomori the manga artist. When visiting Ishinomori Manga Museum, please take the extra time to also visit the Memorial Museum. It is 50 minute car ride from Manga Museum. As stated in the contributed article, Manga Museum was named by Ishinomori. 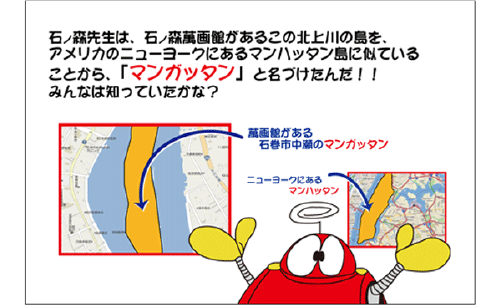 He came up with the idea because the Nakaze Island area, where the Ishinomori Manga Museum was built, has a similar shape to Manhattan. New York was the center of commerce and finance in the 20th century. Ishinomori hoped that in the 21st century Mangattan would be a center of information dissemination of manga culture. “Mangattan Appreciation Event” in March. “Spring Mangattan Festival” during Golden Week in early May. “Mangattan Culture Festival” on Culture Day, November 3rd. 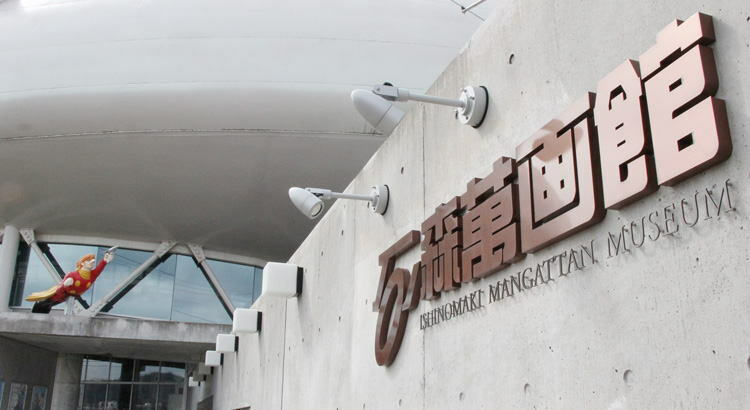 If you look closely at the Museum logo, you’ll see that it is written in English as Ishinomaki Mangattan Museum even though the Japanese is 石ノ森萬画館（Ishinomori Manga Kan). The reason for this is to pay respect to Ishinomori’s strong feelings towards the Ishinomaki Nakaze area, where the Museum is located. The Great East Japan Earthquake, March 11, 2011. 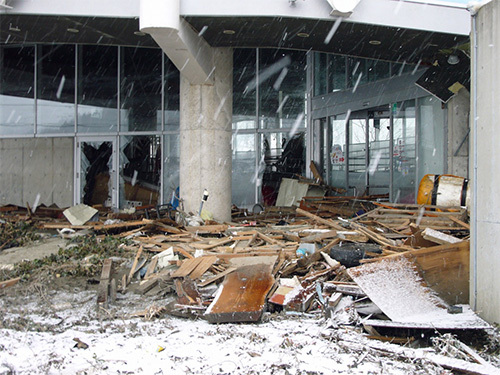 When the Great East Japan Earthquake struck, the tsunami at the museum reached a height of 6.5 meters. The first floor of Ishinomori Manga Museum was completely destroyed, the waves breaking the glass walls and washing all the contents away into the river. Immediately after the earthquake, staff quickly evacuated visitors and five minutes later, the museum was closed. Fortunately none of the staff or visitors lost their lives. Ten days after the disaster, staff started working together to remove sludge and debris from the museum building and in April, volunteers from all over Japan gathered to continue the cleanup work. It was a tough time, no-one knowing when the museum would be able to reopen, but day by day messages of encouragement arrived from all over Japan, and about 10,000 messages were written on the plywood placed to block broken glass from the main entrance. These messages became a symbol of reconstruction and finally on November 17th, 1 year and 8 months after the earthquake, the museum reopened.